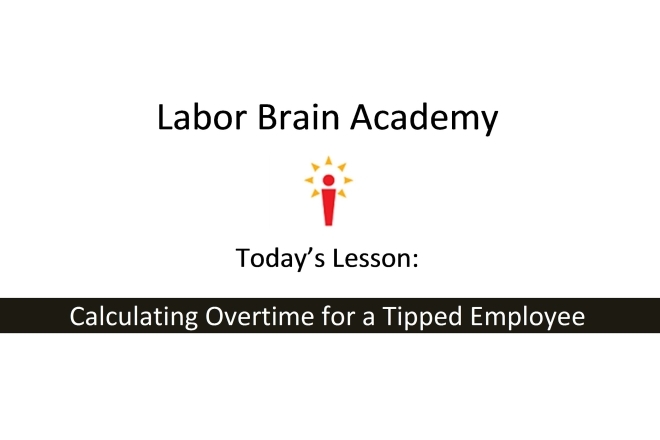 Overtime Rate for Tipped Employees - The Labor Brain Inc.
One of the most common violations found in audits of restaurants is employers paying tipped employees the incorrect overtime rate. Overtime, per its federal definition, is the payment of an additional one half an employee’s regular rate for all hours over 40 in a workweek. Some states have laws that also require overtime after a certain number of hours per day. For employees who are paid a cash wage of less than minimum wage their “regular rate” of pay for overtime purposes is NOT their cash wage, it’s the minimum wage. Unless of course they receive other compensation that must be included in the regular rate like non-discretionary bonuses, service charges, etc. Let’s look at an example of an employee in Colorado. Brian, a server at Pizza House, is paid a cash wage of $4.76 per hour. His employer claims a tip credit of $3.02 per hour to arrive at the required state minimum wage of $7.78 per hour. Brian works 48 hours this week. The $3.89 is one half of $7.78 which is Brian’s regular rate of pay. His regular rate of pay includes the tip credit but it does not include other tips received (anything above $3.02 per hour). The common problem is that restaurant employers pay the overtime premium at half of the cash wage ($2.38). Pizza House has 30 employees, 20 of which are tipped employees that are paid a cash wage of $4.76. They are in the state of Colorado and are covered by state labor laws which require a minimum wage of $7.78. The employer has been paying overtime based on the cash wage rather than the regular rate. The tipped employees work an average of 45 hours per week. 5 overtime hours * 20 employees * 104 weeks *1.51 ($3.89 – $2.38) = $15,704 due in back wages and $15,704 due in liquidated damages = $31,408 total owed. Keep in mind that the variance in state labor laws will affect these calculations. Check out http://www.dol.gov/whd/state/tipped.htm to see a list of state minimum wages and tip regulations. For example, there are six states that don’t allow employees to be paid a cash wage less than federal minimum wage and have tips make up the difference. They are Washington, Oregon, Nevada, Montana, Alaska and California. Also, many states have minimum wages that are higher than the federal minimum wage of $7.25. For example: Colorado ($7.78), Illinois ($8.25), Vermont ($8.60), and several others. We hope you found this week’s tip helpful and informative. 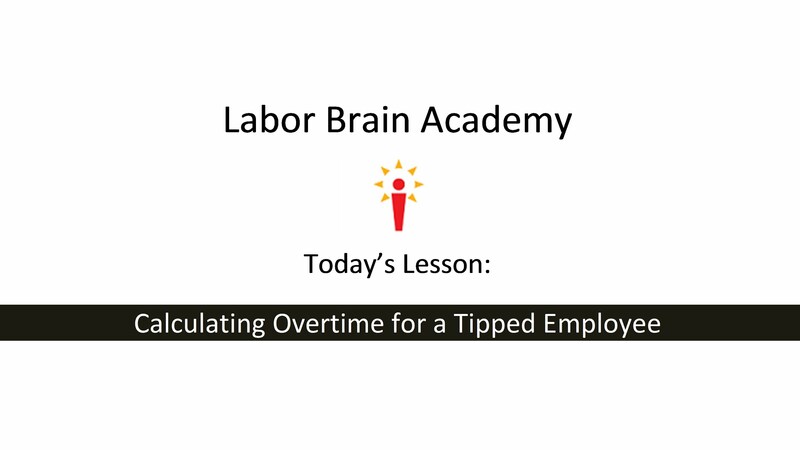 Please pass it along to anyone you think might be at risk as a result of not paying the correct overtime rate to tipped employees. Follow us on facebook to get the next Tip of the Week on your newsfeed!